Several factors increase the likelihood of dreaded orange spots, but the most common is oxidative rancidity, or rancid oils. Like food, each soap making oil and butter has a shelf life. 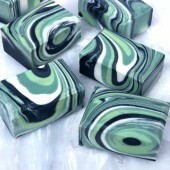 When the oil goes past its shelf life, the chance soap will develop DOS increases. Signs an oil has gone rancid include an unpleasant odor, or change in color. 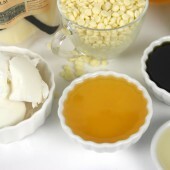 Always use the freshest oils and butters when making soap! In the All Olive Oils Are Not Created Equal blog post, olive oil purchased from small grocery stores were more likely to develop DOS. Because the oil sat on the grocery shelf longer, the oils may not have been fresh. 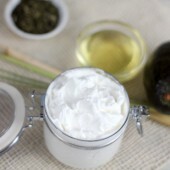 Oils and butters can be stored in the fridge or freezer to extend the shelf life. Always store soap making oils in a dark and cool place. 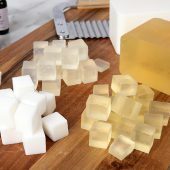 If you’re curious about the shelf life of common soap making oils, the Free Beginner’s Guide to Soapmaking: Comon Soapmaking Oils blog post can help! In addition to using fresh oils, it is important to use distilled water when making soap. Tap water or purified water water may contain a variety of heavy metals from old piping systems or naturally occurring minerals. Old metals and minerals can cause oils in soap to go rancid. Olive oil purchased from various grocery stores produced inconsistent results, including DOS. 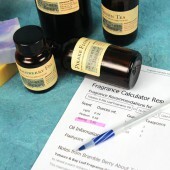 The type of fragrance oil also affects the color of DOS. 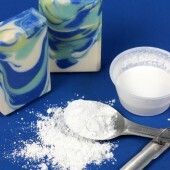 To produce soap with DOS, we deliberately used rancid oils and a high superfat. 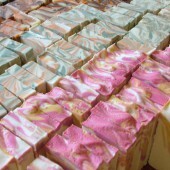 The soaps shown below were made from the same recipe, the only difference is the fragrance oil used. Notice how some DOS spots are dark orange, while some appear as a light yellow. Another factor that may contribute to DOS is a high superfat. 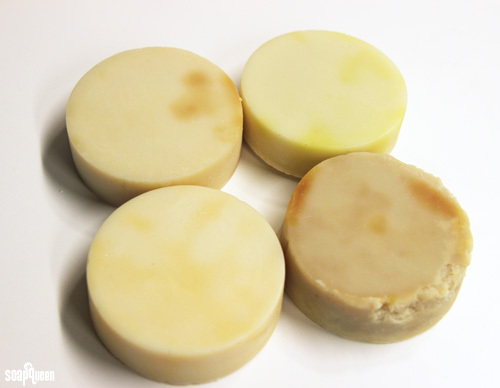 Superfat is the amount of oils and butters in the soap that did not go through saponification. 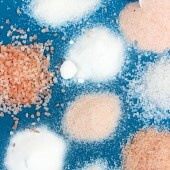 For example, when a soap has a zero superfat, the lye and oils are perfectly balanced and all oils have been saponified. Superfatting the soap at 5 percent means 5 percent of the oils in your recipe did not saponify, and are “free-floating” within the bar. 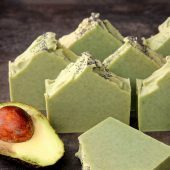 To learn more about superfat and saponification, check out this Superfatting Soap Queen TV video. 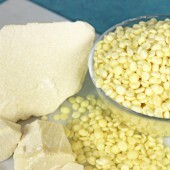 Superfatting soap increases the emolient properties, but also results in a softer bar. 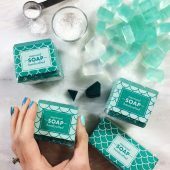 In our experience, a superfat of 5 percent gives soap plenty of skin-loving properties, while still producing a long-lasting firm bar. 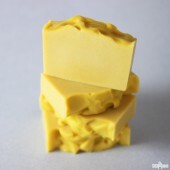 Soap containing a high superfat (5 percent or more), has an increased chance of developing DOS. Because these oils have not saponified, they may go rancid. If you like to superfat your soap higher than 5 percent, Rosemary Extract Oil (ROE), Vitamin E or Grapefruit Seed Extract (GSE) can be used to help combat superfat. Another factor that contributes to DOS is temperature and humidity. 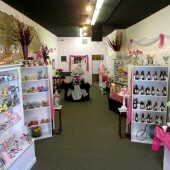 While soap cures, store in a dry, well ventilated and cool place. While curing, soap begins to lose moisture. If the moisture cannot escape, the chance for dreaded orange spots increases. In the Soap Lab, we use a bakers rack with coated metal to cure soap. 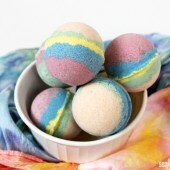 This allows plenty of air to come into contact with all sides of the soap. Why coated metal? Letting soap sit on any metal-rust will contribute to rancidity. Humid air also increases the likelihood of dreaded orange spots. Because soap contains glycerin, it attracts moisture in the air. If you live in a humid climate, investing in a dehumidifier for the soap curing area can be beneficial. 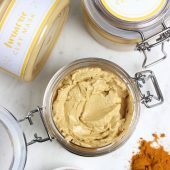 Use only the freshest oils and butters, from a reputable supplier. Research the shelf life of each oil you use, and use them within the shelf life. 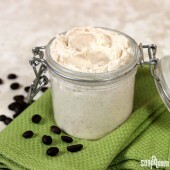 If you will not use the butters or oils quickly, store them in the fridge or freezer to extend the shelf life. Only used distilled water to make cold process soap. Avoid superfatting soap above 5 percent. Do not allow soap to cure on any rusty metal. If using a bakers rack, make sure the metal is coated. Have you ever experienced DOS? If you have any additional tips or tricks for avoiding DOS, I would love to hear them! 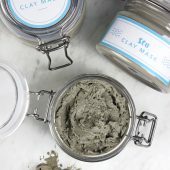 I am currently trying to brand a local soap company and was trying to get them to use more sustainable packaging. Could someone tell me if wrapping a soap in a wax paper would do the trick to prevent glycerin dew? I want to reduce the amount of plastic the company goes through and thought a wax paper packaging could be used. Hi, i bought yr book named pure soapmaking and was making 100% castile-brine soap. Somehow, during the process of mixing saltwater and lye, it causes my stainless steel mug and stirrer rusted. This is my second making this soap and i did not face this problem first time making this soap. I was wondering why this happened and whether the soap is still safe to use? Thank you. 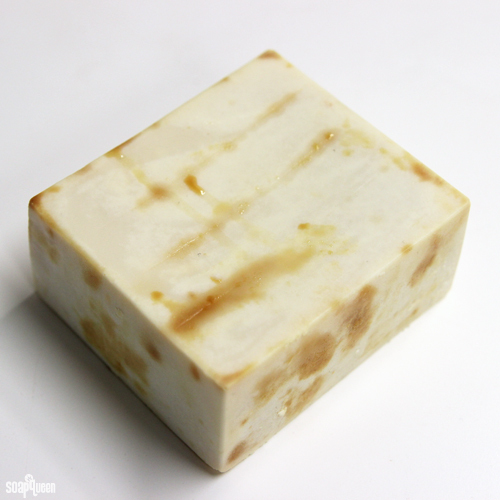 Help..I have been making Cold Processed soap for about a year, all my soaps a huge success with little to no issues save for one….my Honey Seabuckthorn Oil soaps. I use Olive, Sunflower and Coconut with seabuckthorn. I am very consistant in how I make them and take them to trace before adding the next ingredients, also make sure the temperature is not to hot. They are unmolded and cut after one day, but as the weeks roll on little white dots appear. 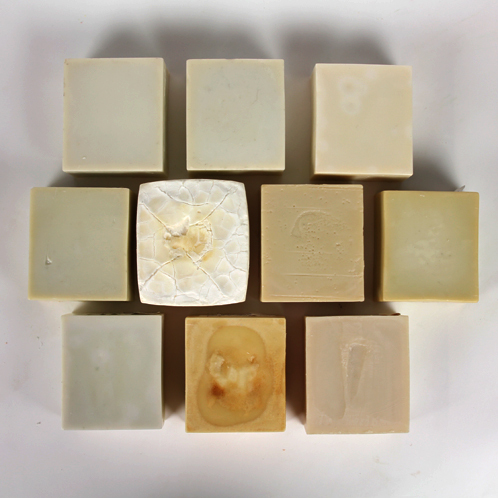 Some on top (which could be air pockets) and some with in the centre …..in past the majority of these soaps have then eventually turned from the rich orange to completely white. I make three types- honey oat, lavender, and lemongrass geranium…The biggest culprit has been the lavender honey- which we recently removed the oats from the recipe, but now it is happening in the Lemongrass. I have made them at a variety of outdoor temperatures and humidity levels and still have the same issue. 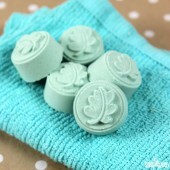 I use wood molds with fresh paper liners each time, soaps are removed from the molds after one day and cut. I use a stick blender and bang out the air bubbles 10 or more times. I am at my wits end trying to figure this out. 1. Why are the colors and scents fading? 2. What is the cause of the White spots? 3. Why does the color leach out the sides at times? 4. Are wood boxes causing any of my issues? Hmm, that is strange! I don’t think it is the wood molds that would cause this issue. We use wood molds often, and they work great for soaping. 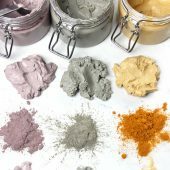 What type of colorants are you using? 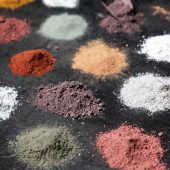 Natural colorants do tend to fade over time. In addition, what kind of scents are you using? If the fragrance is not tested for cold process soap, it may fade or disappear completely. 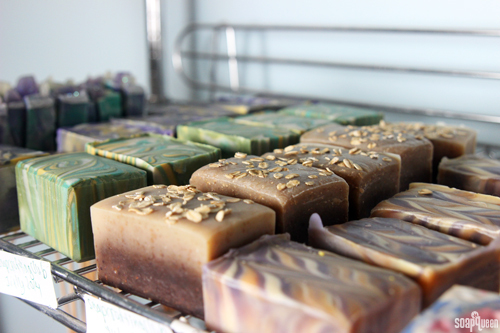 The harsh pH environment of cold process soap can really take its toll on fragrance and essential oils! In addition, how much honey are you using in the recipe? I wonder if the honey is separating from the recipe. 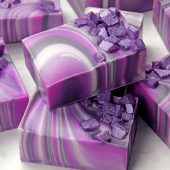 If you’d like, you can message us photos of your soap to the Bramble Berry Facebook page, or to info(at)brambleberry(dot)com. Sometimes seeing the issues can really help us troubleshoot the problem! FYI Chlorophyll will DOS after about 6 months. So its best to find something else for green. I’m very new to soap making so maybe this is normal, but what causes soap to change color after using it? I’ve noticed with a couple bars, after using it portions will become lighter. Say for instance a bar that was 1/2 yellow will end up with patches of lighter yellow along with the initial yellow. Same thing with a bar that was brown, areas of the brown are now almost cream color yet some areas retain the brown. Hmm, that is rather interesting! 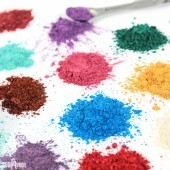 What type of colorants are you working with? 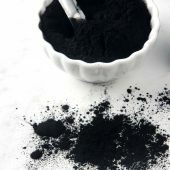 Natural colorants do tend to fade over time. Yellow and green natural colorants in particular tend to fade over a few months. You can see an example of this in the Avocado + Spearmint Soap, at the very bottom of the post. 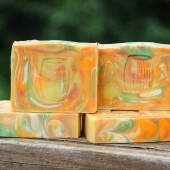 The yellow bar is the Sunshine Soap with calendula from this site. 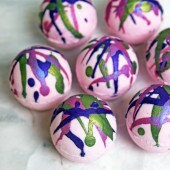 I followed the recipe (it smells wonderful I might add) and used the Fizzy Lemonade Colorant. The only difference would be the mold, I used a loaf mold and poured the yellow on the bottom. I often don’t remove it from the shower, do you suppose it’s just because it sat on the yellow side unable to dry. I told you just the opposite in my 1st email, areas have darkened from the original yellow, almost a dull gold in color. The brown bar has lightened in areas though, I don’t think I added any color, but used anise and orange essential oils. The same holds true, it was left in the shower and it is the side it laid on. I am so confused by the DOS in new batches of just one kind of soap. I make 8 kinds, use fresh oils from a reputable supplier and have DOS ONLY in the unscented bar (colored with indigo leaf). I made two batches and both developed DOS within a week of making. We cure the bars in a very dry, cool room. We also use Vitamin E in the recipe. Have no clue why this particular recipe develops DOS and no others! Hmm, I’m not sure why that’s happening in just the unscented bar! It sounds like you’re doing everything just right. Are they all made with the same recipe? What oils are you using? Are you using distilled water? Also, do the bars smell off at all – sort of like Playdough? Let me know and I’ll help you troubleshoot! I recently made a batch of soap using 15% canola oil. After reading a bit more about canola oil, I’ve found a few soapers who said that they no longer use canola oil because it can cause DOS. I purchased it from a local supermarket and the expiration date is sometime in 2017. Going forward, I’ll only order it online, but I’m stuck for now. Is there anything I can do to help prevent DOS if the soap is already made? It’s still in the mold and I’ll be unmolding it tonight. It has a 5% superfat. Would a silica bead package help at all? It can help to store the soap in a cool, dry place. I think placing a silica packet nearby is a good idea. 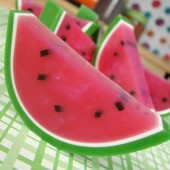 It will absorb excess moisture in the air and keep the soap dry. For your next batch, you may want to lower that superfat to 2-3% to help prevent DOS. With store bought canola oil, it may DOS even with the extra precautions taken. Fingers crossed. I’ll try the silica packet–thanks Kelsey! do you get orange spots with cold process only, or do they show up with cold process/oven process too? I have only ever had this happen to me twice. The first time years ago, the second time today. The oils were fresh (as far as I know) and bought from a large supermarket. The first soap was the only recipe (two batches with different fragrances) where I used sunflower oil, so I concluded that it might have been the high amount of linoleic acid. Never used it again, and never again had a problem, until now. In today’s wrecked batch I tried out an olive pomace oil, again fresh from the same large supermarket chain. The olive pomace turned out to be a 50/50 blend with rapeseed oil. A couple of years ago I measured out one of my tried and trusted batches and left it in the pot to start soaping later on. A family emergency came up and the pot was put away in the cupboard and forgotten about. About three months ago I remembered it haha, and made the soap. That soap is still fine – it contains coconut oil, olive oil and shea butter. Make of that what you will, but for me I’ll be avoiding unstable oils like sunflower and rapeseed from now on, in sodium soaps at least. I have quite a few perfect recipes that I’ve created over the years, and only those two needed ‘testing’. Wondering if you took 100% oil that was highly susceptible to DOS then didn’t do any lye discount at all would you still see problems with DOS? 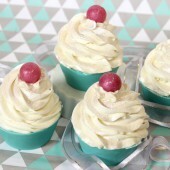 I recently made a batch of CP soap cupcakes. The soaps looked beautiful at first (I wish I had taken a “before” photo) but after unmolding from the silicone muffin pan they started to discolor brownish orange on the top, sides, and bottom of each bar. The discoloration is more intense in the yellow cupcake base, but I can see a few off-color areas in the orange frosting as well. I don’t detect any rancid odors so I don’t think these are “dreaded orange spots”. However the discoloration is so uneven that it doesn’t seem likely that any undisclosed vanilla is to blame, either. The soap almost looks like an overripe banana! For reference, I used Marigold, Lemon, and Bright Cherry LabColors to create a bright yellow cupcake with dark orange “frosting”. My cupcake base contains avocado, olive, coconut, castor, and cocoa butter. The frosting is a very basic palm, coconut, and olive. The FO was from another supplier that said it performed beautifully in CP, but the rest of my ingredients came from Brambleberry. I reached out to the othee supplier’s support team but haven’t heard back. I figured I’d see if you had any advice so I can avoid repeating the same mistake. -I used 1 oz FO for 32 oz of oils. 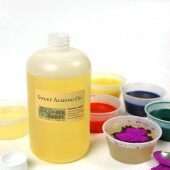 -All of my base oils and butters were fresh and LabColors were unadulterated. -I used distilled water, and sprayed the tops with 99% alcohol after pouring like I normally do. 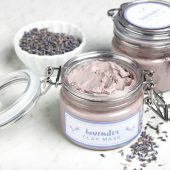 -I double checked the FO supplier website to ensure that the fragrance didn’t contain vanilla. -I soaped at 115°F for the base and 60°F for the frosting. 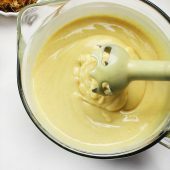 -A stick blender was used for the base and poured at thin trace. 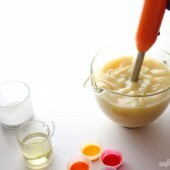 The frosting was whipped with a hand mixer and piped at thick trace. -The same base oils — minus the cocoa butter and avocado oil — were used later that day in a different recipe that contained a different FO (from the same supplier) and different LabColors with no problems whatsoever. Do you have any ideas about what might be going wrong here? Did I use too much fragrance oil? Could this be a LabColors problem? 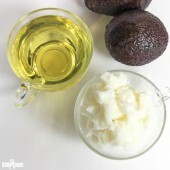 Are avocado oil and/or cocoa butter often incompatible with certain FOs? I don’t seem to have very good luck with CP soap in individual cavity molds in general, most likely due to difficulty getting these batches to go through gel phase. But this type of discoloration is bizarre and has me totally stumped. Your recipe and process sounds just perfect. You can actually go up to 1.6 oz. 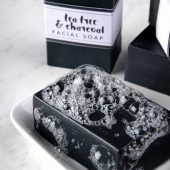 of fragrance in 32 ounces of soap, so you definitely didn’t add too much. From the picture, it looks like fragrance discoloration. That’s why I’m a bit stumped, as the fragrance you used didn’t contain vanilla! I’ve had soaps look just like that when I used a discoloring fragrance. How long ago did you unmold the soap? Does it have an off smell at all? Thanks Erin! I was wondering what the shelf life is if you start using food in your soaps? I am afraid of it spoiling or molding. Would there be a difference between fresh or dried? 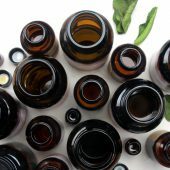 What do you think of using alcohol herbal tinctures? That being said, if there are a lot of purees in the soap, the shelf life may be a couple months shorter. For instance, we made a soap with cream and fresh strawberry puree. It had a shelf life of about 6 months because of all the additives. As for the alcohol herbal tinctures, we don’t recommend those for cold process soap. Alcohol does some odd things in cold process, including really fast acceleration. I have noticed I only get DOS in my batches that I use Lavender EO and Eucalyptus EO. I have done numerous tests with the base oils I am using, good there. I have tested with and without TD, good there. I have tested the superfat percentages (5% – 0%), good there. I have wanted to scream through all of this! Then a couple of weeks ago I looked back at my batches, the ones I made a year or more ago…the batches that were made with organic Lavender EO and Eucalyptus EO never developed DOS! 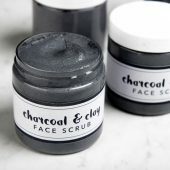 Just a couple more weeks to go before the new batches I made with the organic EO are ready, but they look good so far. Could it be the EO’s are rancid or adulterated? I buy from a trusted supplier, but they could even get a bad batch. That sounds very frustrating, I am sorry about that. I can tell you that our lavender and eucalyptus essential oils aren’t adulterated. However, we do notice spots more with lavender essential oil. 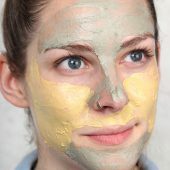 We’ve seen it mentioned over the years on forum and other areas, and we’ve seen some interesting orange spots before with lavender essential oil that were surprising but didn’t come associated with the DOS smell. We’re really not sure why! It may just be one of those odd things that happen with natural products. When working with it, you can lower the superfat and use a dehumidifer to help prevent the rancidity. As for the eucalyptus, I’m not really sure why that one is DOSing. While we have noticed it with lavender essential oil, we haven’t with eucalyptus. Hi. Been making soap for the past 3 years. 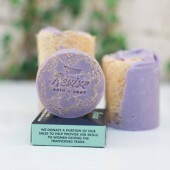 The only soap that I ever get DOS in is my lavender eo soap. All my soaps are the same recipe with only the eo as a variant. I do super fat at8%, add in Rosemary extract at time of blending in lye. 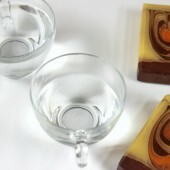 It is a high olive oil soap with 18% cocoa butter, and a bit of castor for bubbles. All soaps are stored the same manner. Weird that it is only the lavender. Hello. I make batches of 50 bars. I would say out of the 50 bars, less than 5 bars end up with a single small orange spot that does not spread to the rest of the bar. I’ve got bars of soap that are a year and a half old that have never developed DOS. I use distilled water, olive oil, coconut oil, shea butter, and castor oil. I cure them on coated metal cooling racks in a not-so-well-ventilated place (I will change that now.) I superfat at 4% before adding the lye water. One thought I had is how I mix my oils. Essentially, I don’t mix my oils. I put them in a pot, melt them down, and then I mix in the lye water. I was wondering if maybe there’s a higher concentration of certain oils in some bars because I didn’t pre-mix my oils. 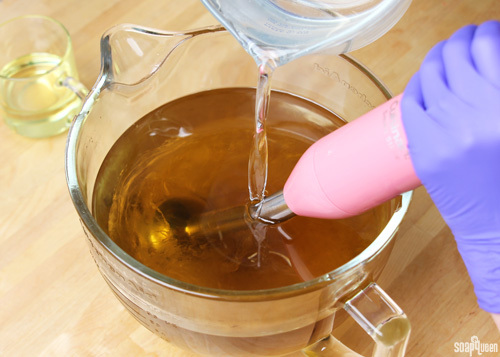 Is it advised to stick-blend your oils before mixing in the lye water? Also, with only 10% or less of my bars showing a single spot, is this normal? Even if you do everything right, will you still see an orange spot occasionally? Thank you for reading this, and I’d appreciate any thoughts! Hmm, that’s strange! It sounds like you’re doing everything just right, and your recipe sounds great. Also, it helps to mix the oils up a bit before pouring in the lye. However, they will get mixed plenty during stick blending, so I don’t think that’s causing the spots. On the bars with the spots, is it just one orange spot? Do the bars get a smell at all? To me, DOS smells rather sharp and unpleasant. Hello. I’m a new soaper and I’ve tried making 15 small batches of soap. Some of my soap had a high percentage of soft oils (mostly canola). Some of my soaps also developed DOS. I let them sit on a cookie rack made of aluminum. 🙁 I’m not happy with the soaps I made that are too soft. 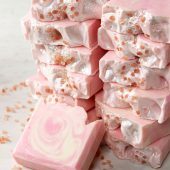 Could i rebatch my high percentage canola soaps and mix it with my DOS soap? I am thinking of adding a color that will not make the DOS so visible and adding hard oils and maybe salt to make a harder bar of soap. Can anyone help me please? I think it may be the aluminum. Lye reacts with aluminum and can create toxic fumes. It may also be reacting with your soap and causing those spots. I would definitely recommend using racks made of stainless steel or another material besides aluminum. That may help prevent those spots! You can rebatch the DOS soaps, but keep in mind that rancidity will continue to spread. In addition, it will develop an unpleasant smell. You may not want to mix the soap without DOS to prevent it from spreading. Soap seeping after it’s taken out of the fridge is actually normal! When the soap goes from a cold space – like the fridge – to room temperature, it can form condensation. It’s the same thing that happens when you have a cold drink on a hot day. After a couple days, the soap should dry out. I tried making a batch with de-ionised water instead of distilled, out of curiosity and un-moulded them last night. This morning I notice the tiniest two orange spots on one of the soaps. My recipe is 45% olive oil, 35% Aloe butter, 20% coconut oil. 5 % superfat and I added 15g lavender and 7.5 g sandalwood oils after mixing the solution to the base oils. It traced quite quick to a thick trace which I didn’t expect. Do you think the water is potentially the issue? Would you ever use any other water than distilled? Additional note – I mixed lye solution = oils at 40 degrees C… usually I do it at 90-100…. Hmm, I’m not entirely sure! I did a quick internet search on distilled water vs. deionized water and apparently deionized water is often more pure than distilled water. We haven’t tested deionized water, so I would recommend making a small test batch of the same recipe with distilled water to see if the same thing happens. If not, there may be something in the deionized water that is doing weird things during saponification. Also, you don’t have to gel small molds! It’s definitely personal preference. Some people prefer gel phase because it helps colors pop, while others prefer the sleek, more matte look of ungelled soap. Can you cut off a section that is effected by DOS, or is the soap completely penetrated as though with mold? You can cut a section off, but eventually the discoloration will appear on the surface and the whole bar will be affected. It is still usable, it will just have an unpleasant smell and the spots on it! Hi! 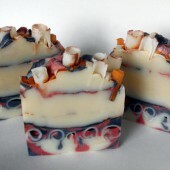 I made my first soap using your Buttermilk Bastille Baby Bar recipe and added 0.5 oz Bramble Berry’s Blue Man FO. It’s been curing for 4 days and it developed DOS! I checked all my oils and they didn’t smell/expired, but it has been humid here. So, I’m assuming it’s the humidity causing the DOS. The soap doesn’t have weird smell right now. Do you think it would smell funny later? Thank you for your advice! If the spots are orange, it may be DOS. Humidity can definitely play a role in oil rancidity. To help prevent it, you can run a fan over your soaps as they’re curing or use a dehumidifier to keep them dry. Also, if it is DOS, it will develop a sharp, unpleasant smell over time. The soap is still usable, but will have an odor. Hi Kelsey! Thx for replying back! I see random orange spots on my soap. There are not too many of them but it’s definitely DOS. 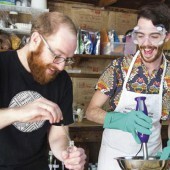 Is it better to make soap in cooler weather? Hot and humid weather can contribute to oil rancidity. When you’re storing your soap, it helps to keep it in a cool, dry place with lots of air flow. If you have a dehumidifer that definitely helps keep your soap fresh! A running fan can help as well. It may also be DOS. Because that bar has a high superfat, the chance of DOS increases. The more freefloating oil a bar has, the more likely it is to form DOS. If you’re in a humid climate or the oil is older, it can contribute as well. I would recommend sniffing the bar. Oil rancidity has a distinct sharp sort of smell. If you notice that, and the orange continues to spot your bar, it is likely DOS. You can still use the bar! It just may be unpleasant because of the smell. Dear Rachel, How are you? Actually I make only Hot Process Soap. I design 12 kind of soaps, 6 base with Olive oil and 6 with Rice Bran oil and my Rice bran oil soap changing color after a month. in the beginning they are very very light color but after turn to yellow. My Olive oil soap has a lots of Olive Paste, So the color naturally its brown and dark brown and even if its change I can’t realize it. oooo I also super fat my soap at 10% bcz Iran is a very dry country specially the place I live. People love the moist of my soap and they don’t complain about drying them skin after shower. I try 5% super fat and people are complain that my soap are not moist. My oil also has at least one and half year time to expire. Hmm, that’s strange! After a month, are you noticing spots of orange, or are the bars going completely yellow? If they’re going completely yellow, it may be discoloration from fragrance oil. Are you using any fragrance oil? Was wondering whether the Titanium Dioxide I used for whitening soap can contribute to DOS? I recently made a batch with it and it is the only batch that developed DOS. From the name I gather it is a metal?? Titanium dioxide is a mineral that is used as a white pigment. In our tests and recipes, we haven’t noticed it causing DOS. However, several other factors can cause DOS including expired oils, heat and humidity. Thank you so much! Well, I am doing all the things you said not to do I guess. I discount my lye 8% because it makes such a nice mild bar that my customers love! I haven’t been using distilled water, only filtered water….yikes!! I use the hot process method, but perhaps I put it away too soon and don’t let it dry enough. How long should I let my hot process soap dry (cure) before I put it away in plastic air tight containers? Also, is there a filter you can put on your faucet that takes the minerals out, or makes the water usable for soap-making, or do you have to buy it at the store every time? We definitely recommend using distilled water. Distilling the water involves boiling it and condensing the steam in a clean container. It removes all the impurities filtered water leaves behind. Distilled water should help prevent that DOS. I was wondering if you used a stainless steel rack or just a plain old metal rack and coated it with something safe to use? I just bought a random rack from a closing Target here in Canada and realized just a bit ago that it’s probably aluminum coated, with copper underneath. Is there anything I could use to coat this in plastic or something safe to use for soap? We don’t recommend storing your soap on aluminum or copper, as both can react with the soap and cause DOS or discoloration. Plastic or silicone may be a good option to coat the rack. I imagine a local hardware store or kitchen store employee would know more! 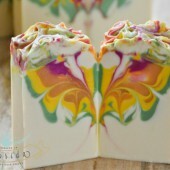 A soaper at our Teach Soap Forum may be able to offer some ideas as well. Hi! I’ve been making soap for about 8 months now and have started noticing some DOS on some of my hot process soap -I switched to hot process as it got closer to Christmas – sometimes I don’t have 6 weeks for it to cure :-). Once the soap dries for at least a month – 6 weeks for the CP soaps – I have been storing it in Tupperware containers so I can stack them for storage/space saving. Is this a bad Idea? If so, how do you store you soap long-term? I don’t sell a lot of it yet, still “playing” with it all so It sits for a while at times. I do live in Florida so it could also be the humidity, or the oil since I WAS using store-bought Olive oil for a while. 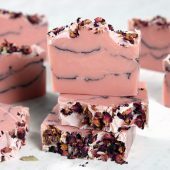 Interestingly I have not had any of the cold process soap get DOS – yet… I have a small home so I need space saving storage ideas if I have to keep all the soap out in the open! Thanks for the help! Thank you! I just think it’s weird that none of my Cold process soaps are having issues. 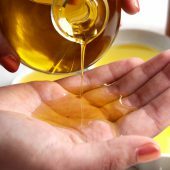 I will say that Ive been using the oil mix used in the Sunshine soap which has no Olive oil for my cold process and I believe all the hot process soaps with the issues have OO in them. Curious! This is an older post, but I hope someone will be able to answer my question. I made 3 batches of soap about a month ago using exactly the same oils, lye, and base recipe. The only difference is in one I infused dried lemongrass and peppermint in one, dried lavender buds in another, and dried rosemary and peppermint into the third. The recipe is 30% coconut oil 76, 25% olive oil pomace, 15% palm oil, 15% raw shea butter, and 15% castor oil with 5% cocoa butter as superfat. 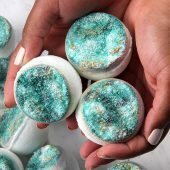 They were all done hot process and the appropriate essential oils were added after the cooked and zap-tested soap had cooled down to below the lowest flash point for the essential oils. They were then all molded into 3-pound silicone molds. They were cut the next day and stored in cardboard boxes in a cool (approximately 65 degrees usually) room where the lights are off most of the day and the only window has a closed blind on it. We have very dry air here. I have stored my soaps in this fashion for the last 8 months that I have been making soap. The lemongrass peppermint soap I made I noticed the other day has developed some patchy/streaky orange coloration to it. The batch consists of 20 bars, and they all have it. They are not pencil eraser-sized spots, they are larger with irregular edges, and not nearly as dark as the pictures of DOS I have seen online. It is on all surfaces of the bars, and when I sliced one in half, it is inside the bar as well. The bars still smell wonderful and are only slightly softer than the lavender and rosemary peppermint batches, but are not what I would describe as spongy. I’ve had a hard time getting a good picture of the spotting, but if someone were willing to email me, I would be glad to send some pictures to help troubleshoot. I really don’t know what to think about it, whether it is DOS or whether it’s nothing to worry about. This is the first time I’ve used infused lemongrass in a soap, so wonder if it could be something related to that. 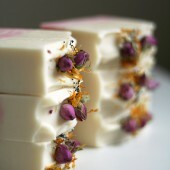 I do not see any similar color variations in the rosemary mint or lavender soaps. I also made a beer soap with the same oils and lye and recipe a couple weeks later and it has not developed any hint of discoloration, either. 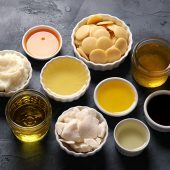 The oils were all purchased within the last 3 months from Soaper’s Choice with the exception of the coconut oil, which was purchased from Soaper’s Choice about a year ago, and the shea butter, which was purchased through Amazon. I have used the same shea butter and coconut oil in lotion bars and past batches of soap with no issues whatsoever. I apologize for the lengthy post. I would greatly appreciate some feedback if at all possible. You mentioned coating the metal racks. What exactly is the coating material? 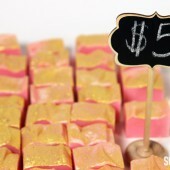 How to get rid of existing brown streaks on the edges of my handmade soap? It only happens to my peppermint soap. I use chlorophyll for green colorant. If you notice brown streaks on the edges of your soap, you can cut those off. However, if it is DOS, those streaks may eventually spread. Thank you for all your help. I like your posts. 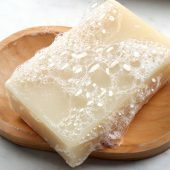 I have a question about re-batching soap made from home frying oil, I like to try and experement different things and I enjoy that. where can I submit my question please? I’d be more than happy to answer your question! What can I help you out with? I do have DOS on some of my soap, I think it happened after I moved to another house and the area where I store them doesn’t have air flowing. Also, it occured only on some and not all of them. I have been making soap for ages, and one soap with mostly soft oils developed DOS after just a few months. I thought the problem was caused by one oil so I made batches replacing one oil each time to find the culprit. I got fresh oils each time. Nothing helped so I figured that my problem was the recipe. I changed it, and added some hard oils. No more DOS (at least until now). I had DOS with scent oils (full water) on demolding, and when a batch seized, one week later, you guessed it. Maybe because the soaps moves so fast that there is a lot of excess oil not incorporated into the soap causing spoilage? 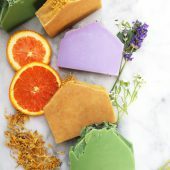 The salt bars made with 15% superfat, did not develop DOS but the soap went rancid and turned almost translucent, and the lavender EO scent disappeared. Suggestions anyone?? Thanks. I think you may have the right idea. If your batch seizes, the oils and lye may not have time to get incorporated fully. This leaves a lot of free-floating oils that haven’t turned into soap. 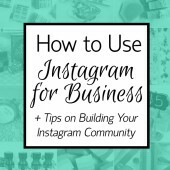 I’d love to help you troubleshoot further. What is in your recipe? Also, where do you store your soap? What is your superfat level? Just made my first batch of CP soap and it has DOS! Help! !I have made sure that I followed all the tips mentioned above, other than how to Cure them. I am based in Pune India and the weather here is very humid in the evenings, while days are very hot. I have seen my friends here, facing the same issue. can you please suggest a way to cure the soap perfectly, in this weather condition. Will try another batch tomorrow, hope you can help me save it from DOS this time. DOS can happen in very humid environments. You may want to get a dehumidifer. They take the moisture out of the air, and should help prevent rancidity. Thanks so much for this post! I have been making M&P soap for over 5 years and this happened to me with one recipe this year. It freaked me out a bit! I will drill down through all your suggestions to see if I can figure out the cause. Thank you. When I started making soap and was wondering into it for a few months, I had oils that should have expired but they looked and smelled just fine. I always store my oils, butters, etc… In a dark and cool place. Since the oils looked fine, I made soap with them. At this moment I’m making soap for 3-4 years and I still have a bar of each soap (all permanently cured and stored on a rack) non of my soaps show any sign of DOS. I do live in relatively dry area and house (I live in belgium). However, when I send a soap of mine to a friend in Florida. The soap got spots in only a couple of weeks, which makes me think DOS has a lot to do with humidity…. But this was only oils used, no herbs or plant matter. I’ll try it again soon, just for fun. I read the part about using rancid oils. I saw am log post on the Otion site, where they did an experiment to see if rancid oils would cause any problems, and they said no. So I tried it, using rancid hemp oil in my recipe. No smell, no problems. Like the lye killed the scent in the oil. I noticed spots once, and it was around each little piece of herb in my infused shampoo bars. I infuse the oils with several herbs. So I’m leaning more toward it being plant matter. I’ll be straining mine more carefully now. While rancid oils can cause DOS, other factors can as well. This includes humidity, the type of water used, etc. Sometimes certain loaves get it while others don’t! It happened with only one of my soaps, and I think it was the fragrance oil. A few months ago I received a sample of Cucumber- Kiwi FO and a sample of Orange Blossom FO, so I made one 2 lb batch and divided in 2. Each lb got one sample bottle in it. Only the one with Cucumber-Kiwi FO got the spots on it, so I think that must be it. I used the same oils with other batches too and no problems. Certain fragrance oils can change the color of the DOS, but we haven’t found they cause the rancidity. This is because fragrance oils are synthetic and can’t go bad. My best guess is that the Cucumber and Kiwi Fragrance Oil colored the DOS in the batch so you could see them more clearly. The DOS themselves were likely caused by older oils or humidity. Thanks for the post. It is really useful. I am quite familiar with DOS as I live in a humid area. However, those spots tend to appear on certain batches in which I use certain fragrance oils (rarely the ones with essential oils) and certain colorants. A few bars of such batches do survive though. For my recent batches I have decided to try to reduce the amount of water I usually use (to pass to 300 g instead of 330 g per 1 kg of oils). I am still waiting to see if there will be any difference. Certain fragrance oils can change the color of the DOS, but we haven’t found they cause it. This is because fragrance oils are synthetic and can’t go rancid. Also, what kind of colors are you using? I had orange spots appear one time with M&P goat milk soap. 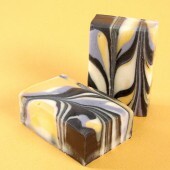 I had used lemon essential oil to make lemon and poppy seed soap. The goat milk was a Bramble Berry premium base and the essential oil was from a name brand essential oil company. I never had an issue with any of the other soaps that I have made using that company’s oil or the olive oil soap base, just the goat milk. Melt and pour soaps have a longer shelf life than cold process soaps, but they still have the possibility to get DOS! As they sit, they will get dried out and crumbly and then possibly DOS. I have only ever had one batch with a very small amount of DOS on it. I used my standard base recipe, but used goats milk in place of water. I have made several other batches of soap with the same oils since with the same base recipes, sans the goats milk and have had no issues whatsoever with DOS (even with extended cure times). 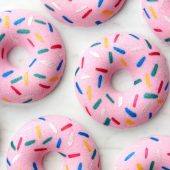 I have been told by other soapers I know that they find soaping at cooler temperatures increases their chances of DOS so I was curious if you had any similar experience? Otherwise, I would assume it was likely the goats milk that caused issues for me. Do you mind if I ask what’s in your recipe? 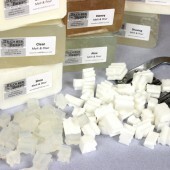 We’ve made several goat milk soaps that have not had any DOS after about a year or so. Also, how did you store your soap? The recipe was equal parts Olive oil, coconut oil, and palm oil with a small amount of castor oil (no FO or EOs or colorant). It was soaped very cool (I froze the milk and only added the lye a teaspoon at a time). They were molded in a PVC pipe and once the loaf was removed I cut and stored them in shelving in the basement with all my other bars. The bars were a nice creamy white color, except for the DOS 🙁 and they were the only bars ever to develop this scourge lol! Hmm, that’s odd! What percentage was your superfat? If you had a lower percentage, I would imagine that maybe the oils may have been nearing their expiration date, or perhaps the goat milk was. I’m glad it hasn’t happened to you again! Yes, those pesky DOS. They ruined my perfectly wonderful sensitive skin – unscented bars. Because the bar is a plain white bar soap, the orange spots were very noticeable. 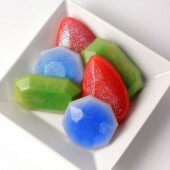 I assume some of my other colored bar soaps must have some as well, but because they are so brightly colored, don’t show. Or maybe it was the use of additional vitamin E oil in that soap, and not any others, that did the trick. Not sure if you have time to respond to these comments, but if you do I have one question. My goats milk soap is made using 100% goats milk in replacement of the water. It of course, overheats so I have to keep it under a fan while curing. My problem is that I cannot stamp the soap ever. I have tried stamping the day after unmolding (like I do all my other bars), then 1 week, 2 week, and so on. To early stamping the bar is mushy, to late stamping the soap crumbles and pushes up (like embossing) around the imprint of the stamp. And yet, it doesn’t seem like there is a happy medium in between those two times either. Any suggestions? Thank you for your time. I agree – DOS are definitely pesky! 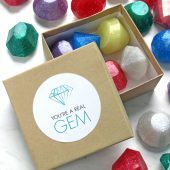 There is a happy medium when it comes to stamping, it just may take a little research to find yours! I’ve fortunately never experienced this, but the information on how to avoid it is great. Thanks. I made a soap a few months ago that had little bits of orange in it around each of the little pieces of c/s peppermint that I had added to it. I was not able to find any mention of this problem for anyone else, but now I’m wondering if it might have been old peppermint and thus had tiny bits of oxidized peppermint oil in each piece. I had assumed this wasn’t DOS because it happened so fast, but now I’m not so sure. The soap seems fine otherwise. Steam distilled Essential oils contain no fatty acids and therefore can not go rancid (and cause DOS). Eventually, their volatile aroma components will evaporate, and their scent will disappear, but this takes many years. The only exception to this is cold pressed citrus EO’s. They only last 12-24 months before their components evaporate away. I store all my EO’s except for Patchouli (it ages and improves in scent as the more volatile components evaporate off) and Cedarwood(it will crystalize) in my refrigerator to slow down the evaporation. If you store your steam distilled EO’s in the fridge, they will last for years. If you’re using the peppermint plant matter, you might be seeing spots around large bits of it. If you want to include plant matter inside your bars, I find it best to puree it, and then strain it very well prior to adding it to the oils. 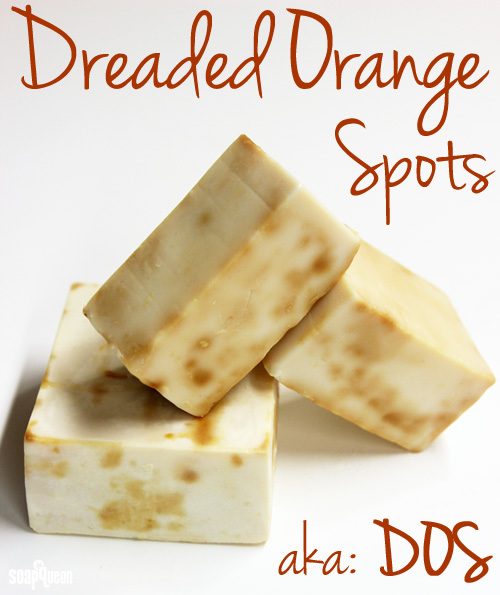 This helps me to avoid getting spots when using fresh fruit in my soaps. Heather gave a great answer! Essential oils will not go rancid. After several years, some of the scent may fade away.